ATV Beadlock Wheels Buyer's Guide. ATV Beadlock Wheels - Buyer's Guide. ATV beadlock wheels are one of those win-win situations you hear so much about. That "Best of Both Worlds" stuff people talk about, but is rarely seen in the real world. So if you're one of those riders that wants the maximum traction offered by low air pressure - without the risk of your tires coming off the rim - here's your solution. Beadlocks have been around for several years in auto racing circles, but ATV beadlock wheels are a relatively recent development. Racers have used them for a while, and now that they have been discovered by the ATV mudding community, their popularity has skyrocketed. Beadlock Wheels for ATVs - Run Low Air Pressure With No Worries. We'll assume you're here because of at least a passing interest in beadlock wheels. So we thought it would be nice to start with a diagram of exactly what it is these ATV wheels do. 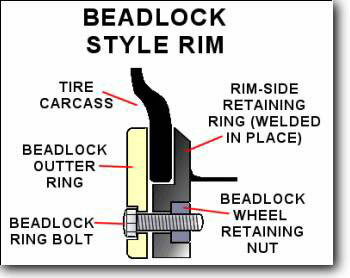 As you can see in the diagram, the tire bead is held in place by being clamped between the inner and outer beadlock rings. This is what allows you to run very low air pressure without worrying about your tire becoming dismounted from the wheel. Simple, yet effective. Win - Win. Here's a short video showing 4 wheeler beadlock wheels in action. What other kinds of goodies go with the wheels? It won't take a whole lot of time to tick off the option sheet, but there are a couple of popular options. Beadring color options are for everyone that wants plenty of style with their function. Either that, or you're obsessed with color matching! 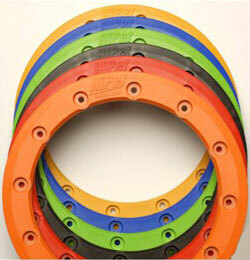 No matter what color your ATV, you can see from the photo that a beadring is available to complement the color. Steel rings are usually powder coated or painted. Aluminum rings are normally anodized for better durability. Mudplugs for four wheeler beadlock wheels are another popular option. Plugs were first developed by racers to keep mud from collecting inside the wheel. The extra weight from the mud will cause serious balance problems, which can adversely effect handling. 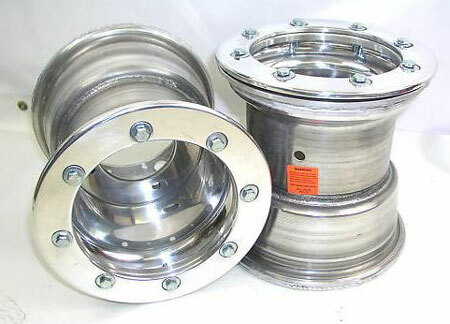 Best Deals on ATV Beadlock Wheels. Looks like it's time to make that recommendation we promised - so here goes. The best deals we've seen lately have been on Ebay Motors. All the competition among the sellers keeps prices down and most of the big name national businesses have stores on Ebay now. The link above will take you directly to the best deals we could find - and they are already filtered so you won't waste time on other listings.